ESRI is supporting the UN Office for Disaster Risk Reduction (UNISDR) 'Making Cities Resilient' initiative, that will help countries around the world, and their cities in particular, map and visualize their disaster risk. This adds to the splendid support ESRI has already shown for the Obama Climate Data Initiative. Making data available - Open Data - so that it's available to the combined brain power of all-of-us to better plan a country's development, as well as simultaneously make more of us better informed citizens, is the new and inspiring way to go - to build disaster-resilient countries. In the insular Caribbean, participating cities are from Trinidad & Tobago, Jamaica, Haiti, Dominican Republic and Cuba. 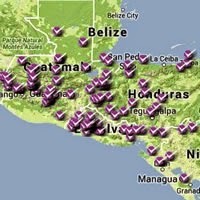 Guatemala and Honduras are noticeably participating in a big way (30+ cities each), along with many other Latin American countries.